Checkout Success page Extension by BSSCommerce will allow you to customize your checkout success page (also known as Thank you Page) to increase the customers’ loyalty as well as improve your company’s sales. Magento Checkout Success Page Extension (also known as Thank you Page) allows Magento site's owner customize Checkout Success Page as they want. BSSCommerce also develops this extension for Magento 2 platform, please check Checkout Success Page for Magento 2 to get it for your Magento 2 website. When the orders have been successfully submitted, many customers are doubtful whether they submit their orders right or not. With the helps of Magento Checkout Success Page Extension, from now customers can view their orders directly on the success page. The details of the orders will include these informations: Order number and status, Date of the order, Shipping address and shipping method, Billing address, Payment method, and all order summary. 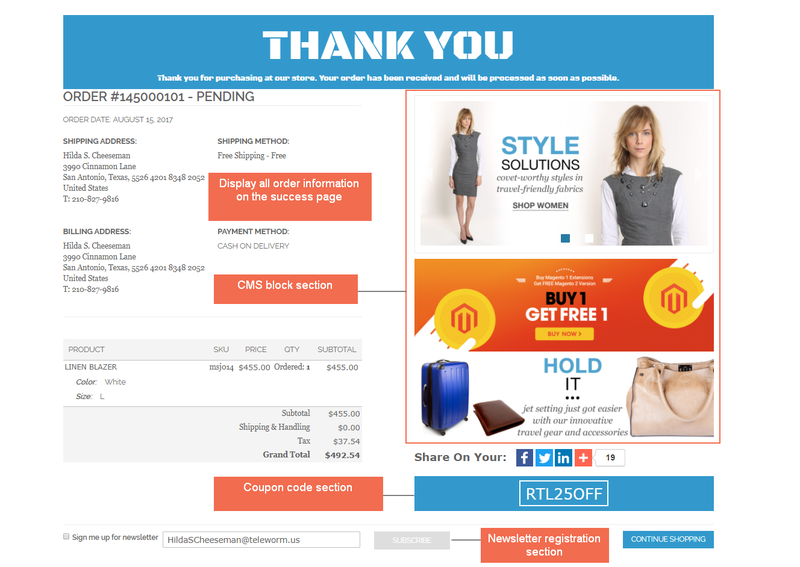 With Magento Checkout Success page Extension, the customers will see a THANK YOU with the site’s owner message . This will impress the customers more than the default message of the magento site. Also in this page, customers can view a list of products that they may feel interested in. This not only saves time for customers but also help Magento site’s owner to sell more products. The classification of this product list will depend on the site owner’s desire. Checkout Success Page for Magento Extension allows customers to click on the social network buttons to share their shoppings. When their friends click on that link, it will lead to the Homepage of the Magento site. This is very helpful tool to draw more attention and get more traffic to your Magento website. Besides, customer can sign up for newsletter in the success page. By doing this, the customers and the Magento site’s owner can stay connect, which will help to increase the customers’ loyalty to the company. By using CMS block (CMS-> Static block), information of other pages in the site are allowed to display in the success page. Moreover, customers can get a discount on the success page for their next purchase. You can choose to enable Magento Checkout Success Page extension and apply it on specific multiple websites and stores. You also can change the frontend’s style, configure order information section, edit the thank you message and configure CMS blocks section, select coupon code to be displayed without no difficulty. Base on your demand, you can choose to display products that customers may find useful and set the number of products displayed as well as a type of product block that will be shown on the success page, for instance: cross sell block, up sell block, related product block or random. 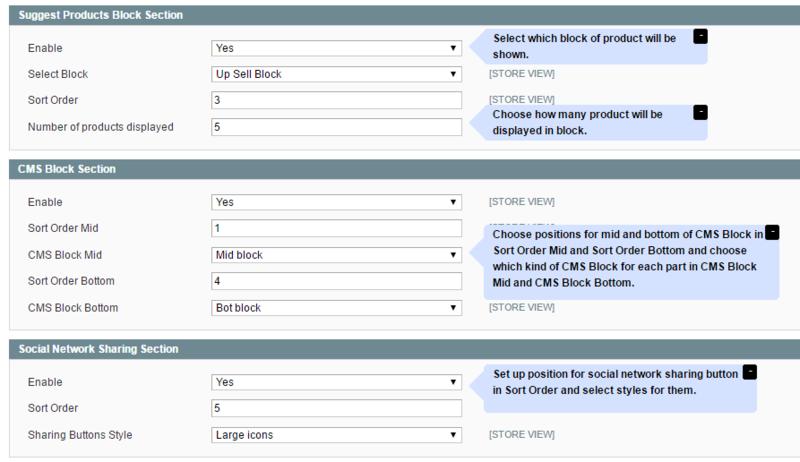 In the backend, below each section, there has a box called “Sort Order” for Magento admins to customize the position of the sections freely. The order will base on spatial position, 1 is the top position and so on. A preview button will help you jump into the Checkout Success Page frontend demo without placing an order. Why Magento Checkout Success Page Is Your Must-Have Extension? Magento Checkout Success Page Extension by BSSCommerce will help admins make better use of the thank you page on your store site. All functions including: order information display and printing, SEO social network share, related cross-sell product arrangement and newsletter subscriptions, etc. are performed on the checkout success page which helps in gaining more sales to your business as well as increasing the customers’ loyalty. Just one page but equipped with various brilliant functions, Checkout Success Page Extension is surely worth your investment! Installing Checkout Success Page Extension and you’ll see the huge benefits the extension brings back! Checkout Success Page Extension is really easy to use. The backend designed in a simple configuration will help you to completely enjoy this extension with its advanced features. After reading your blog about Thank you page in Magento, I realized the importance of thank you page with a Magento store. As expected, this module works very well and helps me so much in improving my website customer experience! I don't know the important of the checkout success page until a friend of mine said that my order success page is so boring and bland. So I searched for some tools or code that could help me to decorate this page. And when I looked on snipplr.com I came up to this extension. The price is ok, and I found a 10% off code so I decided to buy this immediately. Until now, I have nothing to regret my decision. My order success page is no longer boring, in stead, it is colorful and I can make use of this page to advertise some more products. Highly recommend for everyone ! !